I had planned to fish 6th to 8th March with Andy ( you should have been here yesterday) Cowley. Andy couldn’t make it early neither did I in the end. I had a few chores to resolve before I could set off on the 1hr 40 min journey time. Much rain had fallen over the previous day and the river was in flood and brown. 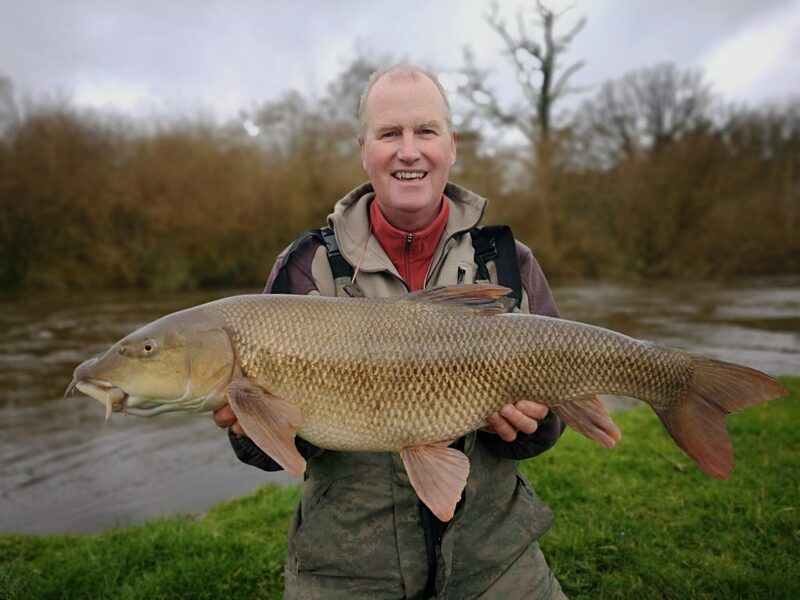 There was only one place to go and it was where I had a big barbel in identical conditions at this time of year last year. I arrived to find the swim empty so I set up stall with my boilie bait and paste. I can use 2 rods in this swim. I was using 10 line and 4 oz lead to hold bottom. It wasn’t the flow that was sweeping the lead off the area it was the debris coming down so that’s why I had 4 oz on. I put both rods out into a deeper area and one I had marked with far bank features. I small bag of broken boilie was hooked on the hook. I sat back thinking about the end of the season and what would transpire. With about 40 mins gone the rod lurched around and the free spoil was giving line. I lifted into a barbel that was certainly powerful. It took me to the far side of the river where luckily there is little weed. I was playing the fish gingerly as it felt big and I only had a size 10 hook. I really wanted to land the thing in slack water just yards down from me. 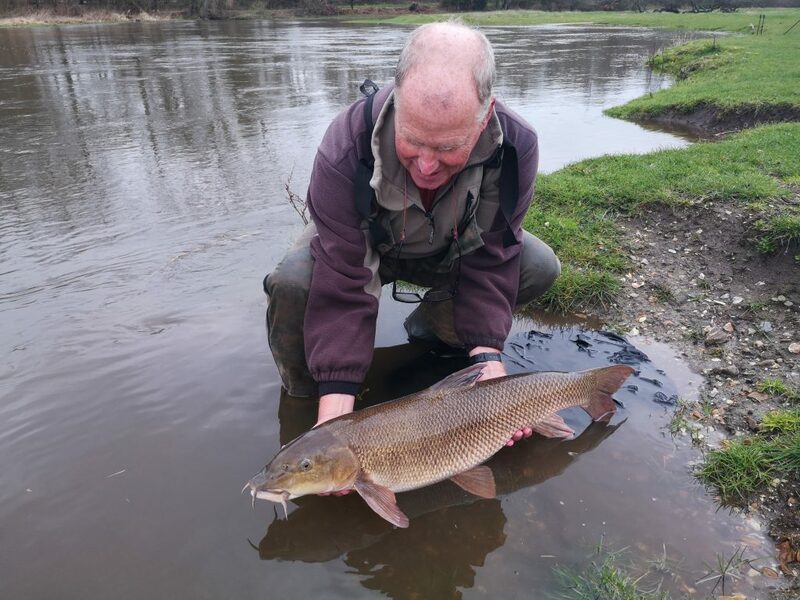 However the barbel starting to think about going to the tail of the pool where the speed of flow increases and if it got in there it would take me way down stream to land it. Not wanting this I put more pressure on and guided it upstream where the flow was less. Again I had to put more pressure on as it really wanted to get into that fast water. It was a persistent thing however my tenacity wasn’t going to wane. After 7 minutes or so it was in the slacker water just in front of me. I couldn’t see the size of it due to the brown river. Just as well I think. The fight continued where it shot off taking line off the clutch because I had loosen it as the fish was approaching the area under the rod tip. I could see it had girth when it rolled a few times. It really was up there with the best fight from a fish I’ve had. I just couldn’t say how relieved I was as she slipped into the net. Once on the unhooking mat I could see it was a new pb. So I rested it in the net while I got the weighing equipment ready. One the scales she went 14lbs 13oz and was 30 inches by 18 inch girth. I phoned Andy who was on his way down and I said I would sack the fish until he arrived. So on making sure she was safe I recast both rods. I was contemplating the epic fight from the fish when the same rod bounced around and the fish taking line off the free spool. I lifted into the barbel and felt a good weight on the other end. Then I could feel the line grating on something. I knew I was nowhere near a snag that is in mid river. This went on for a few seconds I started to move downstream to see if I could release whatever the line was touching, bang the line gave. I was sickened as you don’t get many chances on the H Avon. I recast again. In the mean time Andy was close and he said he was 10 mins away. Once he arrived we got everything ready to photograph the beast. Andy couldn’t believe the size of the barbel. A few photo’s were taken including returning her to the river. I have to thank Andy for some brilliant photo’s. Good bye hope to meet you again. So we were both excited at what could happen over the next couple of days. 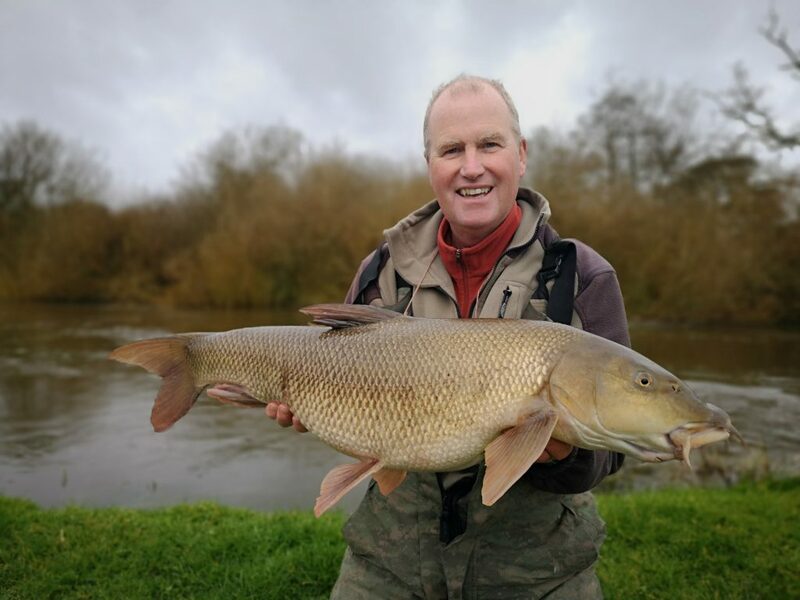 Andy went off in search of barbel himself. I continued to fish until 7pm by which time I had one chub of over 5lbs too. This entry was posted on Sunday, March 17th, 2019 at 5:32 pm	and is filed under Uncategorized. You can follow any responses to this entry through the RSS 2.0 feed. Both comments and pings are currently closed.